Internal replacement light, power and heating circuits are now 95% complete. The saloon ceiling has been completed. The third and final coat of wood stain has been applied to the saloon panelling. New ceilings for the generator area being formed and installed, and the toilet compartment refurbishment has started. Refurbishment continues to make good progress. All the new ceiling lights in the saloon area, kitchen, guards compartment and toilet have been installed. A service light has been provided in the generator compartment. One of the two vestibule lights at the toilet (East) end has been installed with the other waiting for the replacement ceiling panel to be cut and fixed. Also some of the corridor lights at the West (generator) end have been brought back into use. All of the installed lights have been successfully tested. The water tank serving the toilet has been charged with water and proved not to leak, enabling work on re-commissioning the toilet to start. With the exception of one very small area the first coat of staining to the saloon panelling is complete. Levelling and patching the floor of the saloon ready for its ultimate floor covering is 99% complete. Externally the repainting following the graffiti attack is complete except for the white lining for which we will use a vinyl rather than a hand painted line. Geoff Horner submitted some photographs for the Lab11 Gallery showing the latest (24/07/2014) state of the coach, including the repaint following April's graffiti attack. Inside, the lights in the saloon are installed and have been switched on for the first time. Externally one side has had the first coat of rail blue post-graffiti and the other side is in grey undercoat ready for rail blue next week. If the touching in to the orange goes OK then we are almost back to where we were. 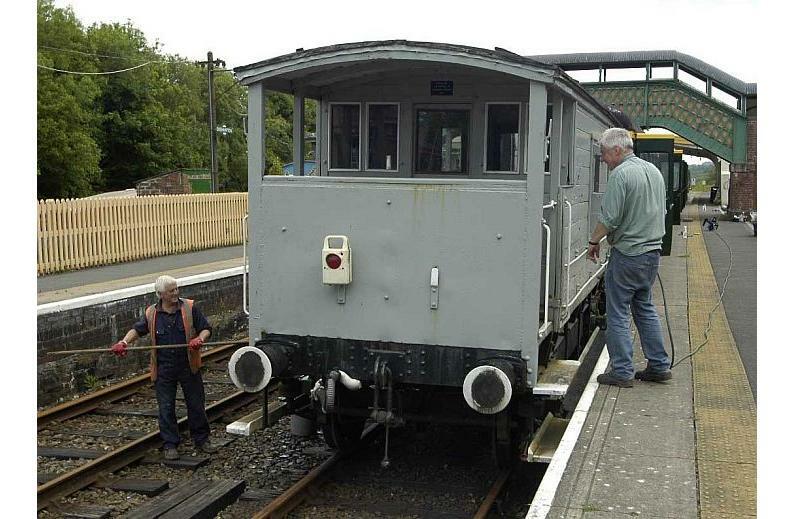 The C&W team took advantage of fine weather to overpaint the graffiti on the LMS brake van. Geoff Horner submitted the following photo of the result, as well as an earlier 'before' picture. LMS brake van after the graffiti was overpainted. The LMS brake van, following its graffiti attack. The external repaint to the final end corridor vestibule doors is close to completion leaving just some minor areas of touching up to finish off. An order has been placed for the various numbering and lettering transfers for both the interior and exterior. Both sides of the saloon have had the insulation and plywood wall lining replaced. Most of the redundant wiring and pipe work has now been stripped out and the electrical re-wiring has been started. We're grateful to C & W member Phil Hull for collecting various items of scrap, the sale of which has contributed towards the Lab11 refurbishment costs. The Meldon weather has so far not prevented the C & W team progressing with Lab11. The external repaint requires just one of the end corridor vestibule doors to be painted and some minor areas of touching up after which it will be completed. A quotation is being sought for the various numbering and lettering transfers for both the interior and exterior. Once these are received the exterior ones will be applied as soon as possible. The interior signs will be one of the last items to be applied once all the interior work and redecoration has been completed. Martyn Skinner and Tris Logan, who both have their everyday businesses and jobs to manage, have now resumed their work on the generator/engine/compartment. They are now planning the move of the combined unit back inside the generator compartment, refitting the exhaust pipe and silencer and connecting it all up to the distribution panel. A broken quarter light window is in the process of being replaced – another case of learning on the job how it all fitted together. Work on the interior refurbishment has commenced. The guards compartment has been repainted. One side of the saloon has had the insulation and plywood wall lining replaced and a start has been made on doing the same on the second side. The majority of ceiling panels are loose fitted to allow the various wiring conduits to be run through the space above the ceiling. Redundant wiring and pipework is being stripped out ready for the re-wiring and for the toilet plumbing to be reinstated. The progress of the interior works means that we are not so far away from needing to consider the type of floor covering to go in the saloon. Since our last report very good progress has been made and some important milestones reached and passed. David Trant has completed the overhaul and rebuild of the diesel engine to power the generator and has given the engine a satisfactory test run. Under David’s direction and with the help of some unorthodox arrangements of beams, hoists and pulleys the engine was manoeuvred back inside Lab11. We are indebted to David for all his work on the engine and getting it back in the carriage and mounted on its base frame. We are also indebted to two of our regular C & W team. Martyn Skinner and Tris Logan have laboured for several months getting the generator compartment cleaned out, painted in fire retardant paint and generally ready for use again. They have also replaced damaged parts on the generator and have now coupled generator and engine back together again as one unit. Once some final adjustments are completed the next challenge will be moving the combined unit back inside the generator compartment, refitting the exhaust pipe and silencer and connecting it all up to the distribution panel again. With a ‘fair wind behind us’ we may well have a working generator back on line by the year's end. The external repaint is also progressing very well. Both sides have had two coats of ‘Rail Red/Orange’ applied and the final areas of second coats of ‘Rail Blue’ will hopefully be completed shortly. The white lining above and below the windows is about 40% complete and decorations are well under way on the West end with the East end to follow. Our thoughts are now turning towards the interior refurbishment with the complete rewiring the first major task to be dealt with. Consideration now needs to be given to the ultimate use and décor of the interior of the open saloon. C & W’s efforts continue to focus on Lab11. Our thanks are due to David Trant who has now completed all the remaining welding work which will enable areas of door trim and floor replacement to be completed. David also reported that his work on the generator diesel engine was now progressing well and we are now planning for its early return. The generator plates have been replaced for us by C & W member Martyn Skinner who is also sourcing a replacement exhaust system (he is hopeful of getting one through his work contacts at little or no cost). Externally the carriage is now resplendent on both sides in rail blue/rail orange red livery. One side has had the most of the second coats and some of the white lining applied. We remain hopeful that the exterior painting will be completed this month. However one qualification that could have an impact on this timetable is the weather. Very wet or cold weather means that it is impractical to keep the shed doors open whilst working. Without mains electricity the level of natural light augmented by that which the lamps powered by our generator produce, whilst sufficient for many tasks, is not good enough for painting when the doors have to be kept closed. The first coat of 'Rail Blue' has been applied to the North side of the carriage as can be seen in the picture below. A start has also been made on repainting the ends in the 'Warning Yellow' as they were when in service in BR test train days. 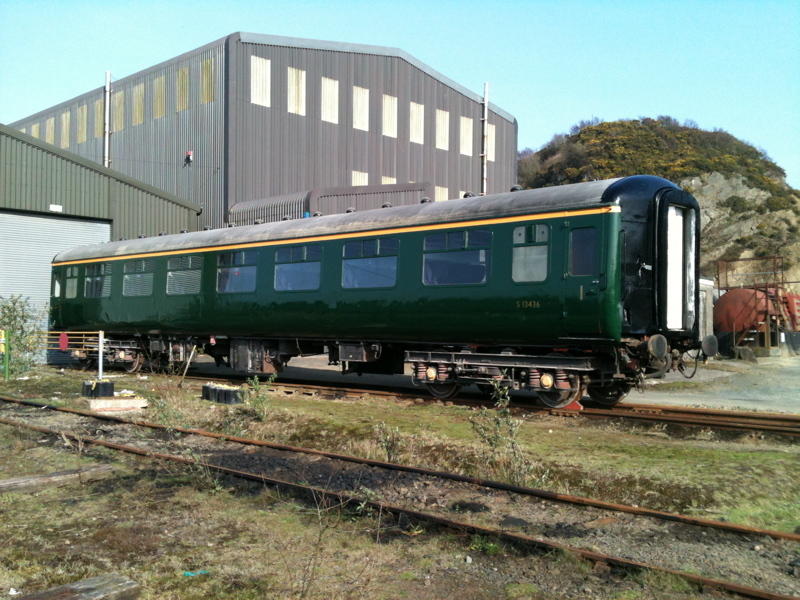 The intention is to paint it in the British Rail research livery applied to the coach when it served as 'Laboratory 11'. Showing the start that has been made on replacing the coach ceiling with the insulation pads in place and the first two side panels positioned. Phil Hull busy tidying up one of the door frames. A joint effort by the Carriage & Wagon and Station Maintenance teams prepared the stock for the PLEG charter (see News Page). By the time the usual suspects turned up on Tuesday 18th to finish the job, Dan Roche had already done the lion's share of the work. Coxon and Kelsey grapple with the railway's motley collection of hosepipes, in an attempt to clean the LMS brakevan. The work on refurbishing Lab11 has taken a major step forward with the completion by David Trant of the cutting out of a corroded section of underframe and the welding in of a new section. Meanwhile the long task of preparing the exterior bodywork is now reaching the end with just a couple of small areas left to be dealt with. The application of undercoat can then begin. David Trant cutting out part of the old frame. Ready for the new section. The new section in place. Mike Ireland working on one of the last areas of preparation whilst Phil Hull reflects on the past or contemplates the future. 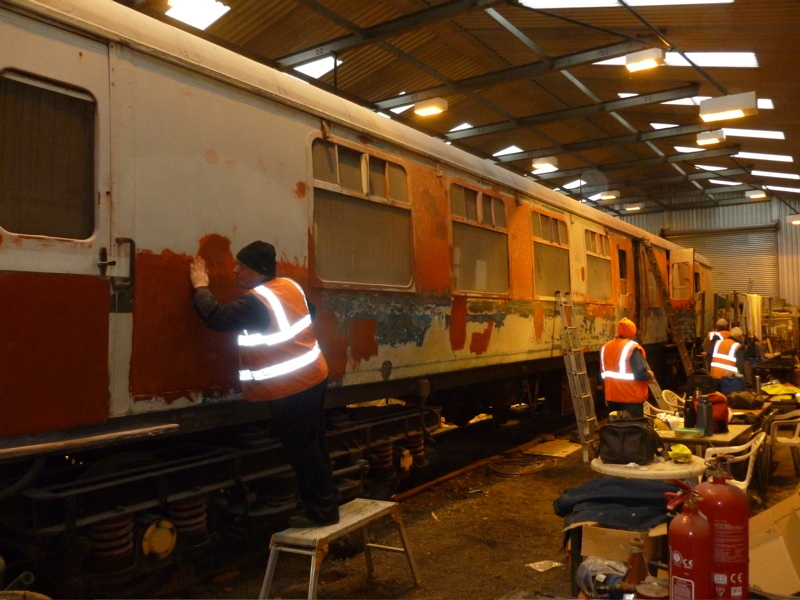 In anticipation of the promised arrival of steam power for this season the C & W team are giving a makeover to the class 117 DMU centre coach number 59520 which is owned and maintained by member Julian Pope for use by the Dartmoor Railway. This coach is vacuum braked and is a vital part of the railway stock suitable for use with steam locos. Stages in the successful repair of a deep dent at the end corner. The former Serco Test Coach (ex 4TC Driving Trailer 76277/DB977335) more familiarly known as The Rocket has been in the shed for a repaint prior to its use generating power for the Valentine train on 15th February. The photographs below show it in its before and after state. C & W have now turned their attention to the ex Class 117 DMU centre coach number 59520 which is being given a repair and repaint ready for use as part of the vacuum braked set needed when the anticipated steam engine arrives for the summer season. Meanwhile, other members of the C & W team have continued working on the exterior of Lab 11. 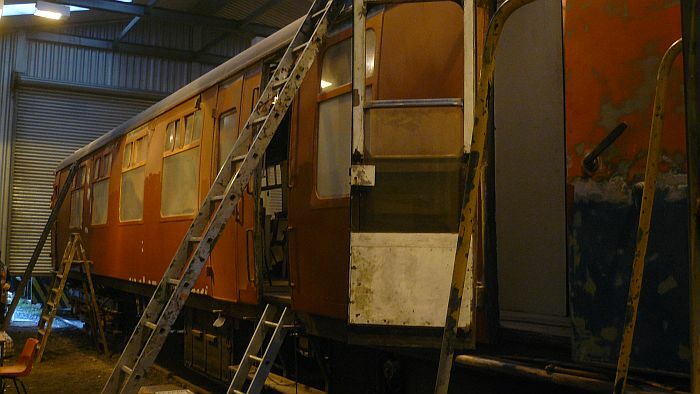 Work on the external refurbishment of the DRSA's 'Laboratory 11' carriage continues making steadily progress. The first undercoat on the roof is now about 95% complete; the final weatherproof top coating will be applied very soon. Good progress has been made on both sides of the bodywork, about 80% of which has now received the first coat of red oxide primer. (See photos below). Work on the overhaul of all the doors and their drop lights is also under way. However with the new operating season rapidly approaching even busier times are ahead for the C & W group. As can be imagined there is a good deal of work to be done over the coming weeks to get the passenger stock ready and in a state in which we like to be able to present it for public service and any additional help would be gratefully received. Thursday is the normal work day for the group but with the amount of work programmed this is likely to be expanded to perhaps an additional day on a Tuesday or Wednesday plus some Saturdays. So if you have the time, skills and just as importantly the enthusiasm to offer please do get in touch via the volunteer coordinator or the website. After a first coat of primer. 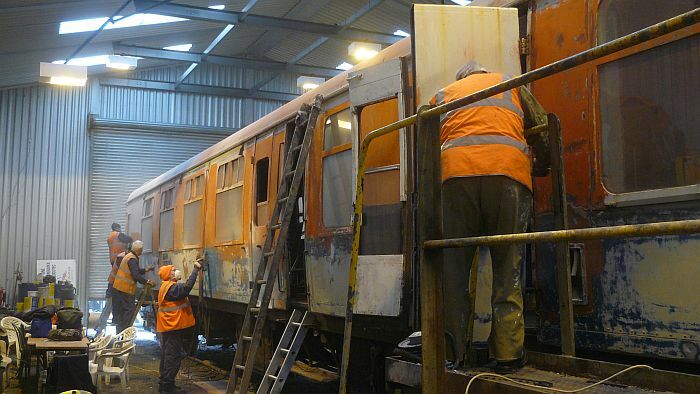 Work has started on restoring our ex-BR Research Laboratory 11 Mk1 Coach. The gang are preparing the body for a new coat of paint, whilst the on board generator has been removed for restoration. A British Railways Mk2 First Corridor Coach has joined our fleet. Built in 1968, 13436 is intended for use in the locomotive hauled vacuum braked rake. It is a valuable addition to the fleet that will increase our passenger carrying capacity. The vacuum braked rake can be used with diesel locomotives, but is particularly suitable for use with visiting steam locomotives. 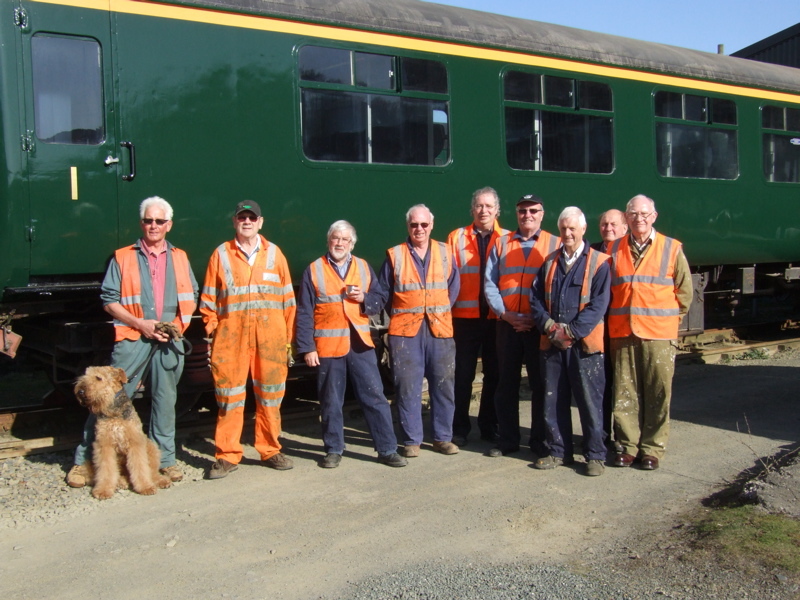 it has now been painted Southern Region Green by our volunteer Carriage & Wagon group. There is still some work to do to the coach before it can enter service and if you are interested in taking part in the restoration, please contact our volunteer coordinator.